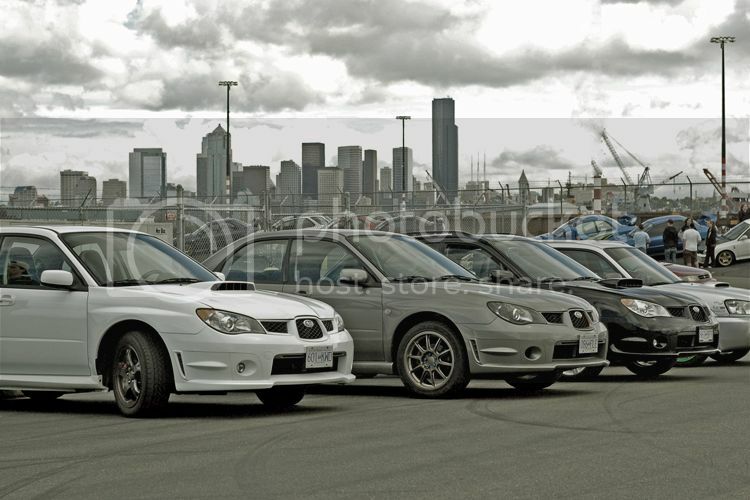 Last Sunday was the 3rd annual Alki Beach meet in Seattle and I had chance to go down for the second year in a row. This time I had my Sirius radio with me to keep me occupied. My wife bought me an extra car kit and I was really looking forward to using it. With an FM transmitter, you have to find a spot on the dial where there are no FM stations broadcasting. In a large metropolitan area, that can be hard to do. In Vancouver there's almost a station on every spot. Luckily, when you do find a spot, the sound comes in pretty clear. It means, however, that when you travel long distances, you may need to change the FM frequency to avoid getting strong signals from other stations in other towns. On the way down to Seattle, I only had to change the frequency once or twice to keep getting good sound. But when we reached closer to the downtown core of Seattle, I completely lost the ability to transmit an FM signal. I knew that I hadn't lost the satellite signal because I could still see two bars of signal strength on the display. Regular FM stations came in loud and clear and there seemed to be a lot of blank empty spots on the dial for the FM transmitter to work. However, I could hear nothing but static from Sirius no matter what frequency I tried. I thought it may have been the FM transmitter antenna that came with my Stratus radio and said "FOR USE ONLY IN CANADA" but when I disconnected it the problem did not go away. Could have my radio been defective and suddenly failed? Even when I left Alki Beach and got back on the I-5, I still couldn't hear anything and I was forced to listen to some CDs. I was worried that I would have to get the radio fixed before we left for our road trip. About 45-minutes to an hour outside of Seattle (traffic was very busy), I started getting reception back. The further I got away from Seattle, the stronger the signal was until eventually it was as good as it had ever been. I guess there was nothing wrong with the Stratus radio. I just find this behaviour very strange.... Why wouldn't my in-car FM transmitter not work in downtown Seattle? At least I won't have to worry about this problem in the Odyssey because it has an AUX input and I won't have to use the FM transmitter at all.